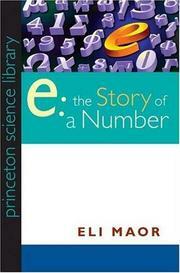  This book that dares to use ``e'' in its title is not for mathematicians only. Adults with open minds and students just beginning to make their way through algebra and trigonometry will find much that is easily digestible and even palatable in this lively presentation of the mathematical revolution that took place between the age of Newton and the late 19th century. Maor (Math/Northeastern Illinois) begins with logarithms, the work of John Napier, a well-born Scot and fervent anti-Papist inventor who spent 20 years working out the first log tables. The author then introduces ``e'' in a thoroughly practical fashion: The number (2.718...) is the limit of a special case of the formula for compound interest. With that as a teaser, Maor goes on to demonstrate how e crops up in marvelous ways in calculus and in beautiful graphs that link it with other memorable numbers. Indeed, one of the most celebrated equations in mathematics states that e raised to the pi times i power = -1 (i= the square root of -1). This is all nicely wrought, with diagrams and informal developments of equations in the text. (Appendices supply formal treatments.) But to the bare bones of the math Maor adds descriptions of the major innovators, their quirks, and their quarrels, ranging from Newton and Leibniz fighting over the invention of calculus to the not-so-petty jealousies among the Bernoullis, from the brilliance of Leonhard Euler (who first named e) to the eccentric Georg Cantor, who established orders of infinity and demonstrated that e and pi were only two of an infinite collection of transcendental numbers. It's worth reading the book just to find out exactly what that last phrase means. Pithy, punchy, and surprisingly accessible.